Sterling Silver, Green White and Orange, Irish Flag Charm Bead from Solvar Jewelry. 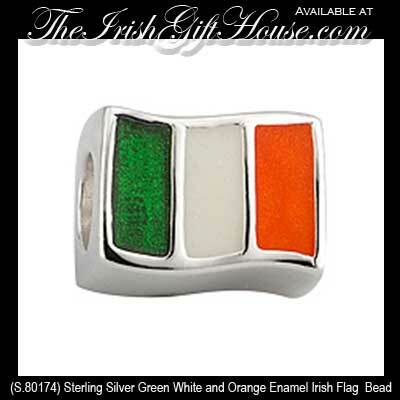 This enamel, Sterling Silver, Charm Bead has the Green, White and Orange Colors of the Irish Flag. This gift boxed Irish Tricolor charm is 1/2” Wide and fits all competing bead bracelets and is made by Solvar Irish Jewelry in Dublin, Ireland. From the Constitution of Ireland, Article 7: The national flag is the tricolor of green, white and orange. The flag is divided into three equal stripes and its width is equal to twice its height. It is used as the civil and state flag and as the civil and naval ensign. The green stripe represents those of native Irish descent, the orange stripe represents the descendants of 17th-century British colonists (a group which supported William of Orange in the War of the Two Kings), and the white stripe represents the hope for peace between the two groups. Thomas Francis Meagher, a leader of the Young Ireland movement, presented the flag to the public for the first time at a meeting held in Waterford City on 7 March 1848. A month later, he spoke as follows when presenting the flag to the people of Dublin at another meeting: The white in the centre signifies a lasting truce between the ‘Orange’ and the ‘Green’, and I trust that beneath its folds the hands of the Irish Protestant and the Irish Catholic may be clasped in generous and heroic brotherhood. The Green Flag was used by the contemporary supporters of Daniel O’Connell, but the Young Irelanders were republicans and required a distinctive emblem which would clearly express their republicanism: the design of the new flag was modeled on that of the French Republic. The original tricolor (in which orange was placed next to the staff) was virtually forgotten after the collapse of the 1848 rebellion but it was revived by the Irish Volunteers in the Easter rising of 1916 when the colors were arranged in their modern order. Although the Volunteers used the Tricolor and the Green Flag side by side, the two flags came to be associated with the supporters of Sinn Féin and of the Irish Parliamentary Party respectively during the turbulent period following the rising. The landslide victory of the republicans in the general election of 1918 ensured that the Tricolor would be the future national flag.